In support of National Apprenticeship Week, on 7th March High Tide held a Career Marketplace to encourage more students to choose apprenticeships as a pathway to a great career. The event was held in partnership with the expert apprenticeship and training provider, Northern Skills Group, and ran from 9am-12pm at the STEM Centre within Middlesbrough College. With around 50 Middlesbrough College students attending, as well as members of the public and schools groups, the event saw around 140 people pass through throughout the morning. The schools who attended included Unity City Academy, Freebrough Acedemy, KTS Academy and Beverley School. 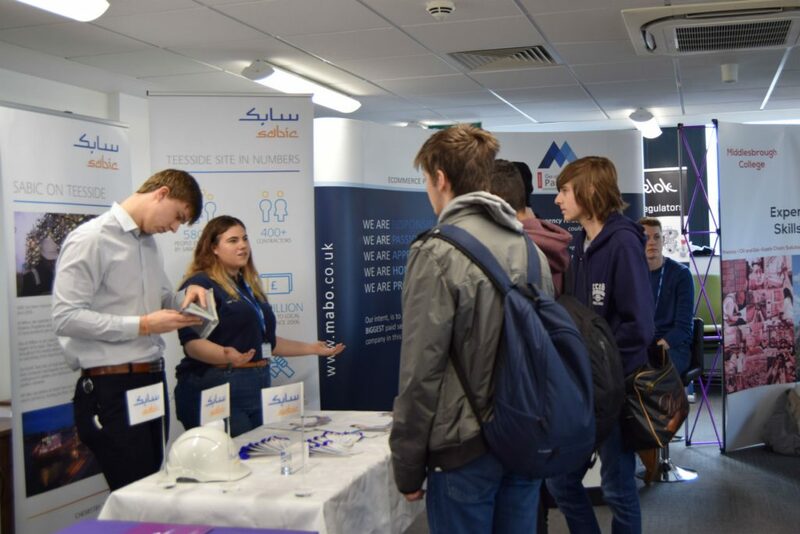 The aim of the Marketplace was to showcase the companies who support and offer apprenticeship opportunities around the area and to increase awareness of these opportunities amongst students. Aside from High Tide, Middlesbrough College and Northern Skills Group, a number of other companies held stands at the event to showcase their apprenticeship opportunities including SABIC, Mabo Media, Analox, Stockton Riverside College, Tees Valley Logistics Academy and Womble Bond Dickinson. The students were able to access information about the different careers and roles as well as the different opportunities across a range of industries including digital marketing, logistics, law and manufacturing. With a number of companies already registering interest in supporting the event again next year with their company stall, this event has potential be set as an annual event to support National Apprenticeship week. We’d like to thank Northern Skills Group for helping us to make this event happen and media volunteers Katie Ward and Joshua Smith from Middlesbrough College for assisting with the photography of the marketplace!